Last month, I had the pleasure of moderating an excellent panel at the Consero Legal Operations Forum entitled “Dashboards & Portals: Leveraging Existing Operational Investments for Greater Returns,” in Pasadena, CA. My esteemed panelists included Scott Fuller from Applied Materials, Brian Pomeroy from Discover Financial Services, Elizabeth Miller from Dolby Laboratories, Julie Cremeans from Fair, and Emelita Hernandez-Bravo from Fitbit. Each panelist brought a fresh perspective on how to best leverage data and analytics in a sophisticated law department. The audience consisted of the vast majority of the conference’s attendees and included legal operations professionals and practicing lawyers from approximately 80 different companies. Prior to the conference, Consero sent a questionnaire to all attendees, asking them to prioritize the legal operations topics that were of most interest. The table below represents the top 10 topics by interest level, of the 21 topics listed. Notably, the top three topics all involved analytics, and dashboards garnered the most interest. These are clearly areas with a lot of buzz as legal operations leaders seek to capitalize on insights that are often left untapped in various data sources. During the session, we conducted real-time polls on four foundational aspects of using dashboards and portals within the legal department. Votes were logged from 51 unique attendees, a participation rate of approximately 63% of those present at the panel. Taken together, the results of these four polls clearly confirm HBR’s experience that both dashboards (including the attendant analytics-driven insights) and legal department portals are viewed as important investments for most legal departments, but the strategic value of such investments is still in the evolutionary stage. These results confirm our experience that at an overwhelming majority of legal departments (90% in this case), the value of data analytics has yet to be fully realized, with maturity at or below the diagnostic level. A significant but simple reason for this is that we still find ourselves in a relatively early phase of the dashboards and portals “revolution.” This is evidenced by responses to the other three polls as well as conversations my colleagues and I have with our clients on an almost daily basis. 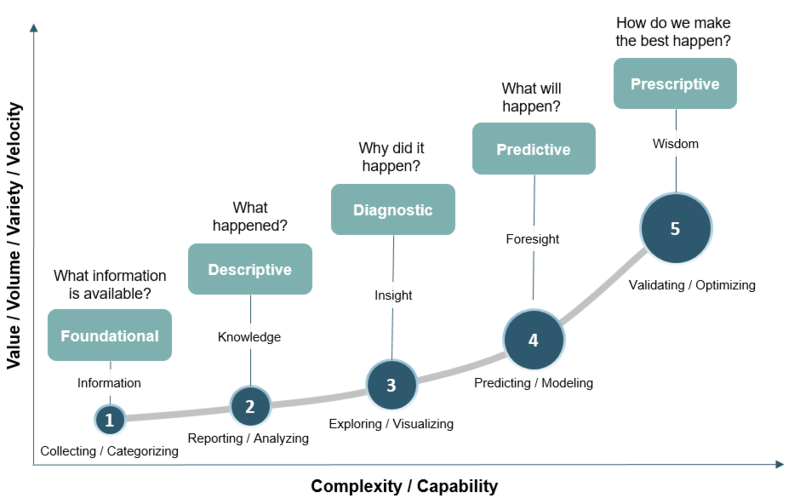 Both predictive analytics (8%) and prescriptive analytics (2%) are considered mature because the insights gained at this stage are unique, actionable and defensible, and thereby offer a window into the department, its operations, personnel and matters that are not otherwise attainable. This poll is essentially a drill-down on Poll #1 into the specific area of legal spend analytics. However, as with Poll #1, the results reveal a still-maturing function that is clearly on the minds of over 90% of the respondents. Additionally, nearly half of the respondents (49%) indicated that a solution had already been implemented. What is interesting is that 60% of those who have not invested in a legal spend analytics solution yet are currently in the market for a solution. These participants are in a relatively good position since they can avail themselves of feedback and lessons learned from their peers at other departments who were early adopters of legal spend analytics. At HBR, we have identified two key categories of considerations for those evaluating third-party data analytics solutions: (1) functional capabilities, including ability to aggregate multiple sources into a common view, speed of response time, and simplicity of use; and (2) vendor knowledge and experience, including breadth and depth of experience with similar legal departments, knowledge of legal operations best practices, and feedback from existing / former customers. Lighthearted on its face, Poll #3 offers attitudinal insights that are as critical as any other factor in the ongoing transition to a data-driven legal operations function. As with most emergent technologies, dashboards and portals have the potential to intimidate or feel threatening to what may be viewed as a stable and effective operating environment. However, among this audience of legal operations leaders, this was not the case, as an impressive 93% of respondents are clearly on board and engaged with these solutions. Unsurprisingly, HBR’s experience in the marketplace confirms this as well, although 93% is still an amazing number! Our clients routinely tell us that dashboards are particularly addictive as they present both objective sources of truth about their department’s current operations as well as offer actionable insights for improvement that simply are not available anywhere else. Similarly, our clients indicate that almost immediately after implementation, portals become a necessary daily destination for most of their colleagues. In both instances, the mind shift from the pre-dashboard or pre-portal state occurs rapidly and is universally viewed as a key evolutionary step for such departments. Focused exclusively on legal department portals, these results illustrate that although attitudes are hugely positive (see Poll #3), an overwhelming majority of respondents view the status of their portal as underdeveloped or developing. Stated another way, 75% of respondents do not consider their portal to be efficient. While we are not surprised by this result, we note that by their very nature, portals often take longer to reach steady-state (or become “efficient”) than other user-facing tools. Regardless of the size or sophistication of your legal department, gathering useful information from multiple systems and sources (e.g., finance, HR, corporate) and presenting it in a welcoming, easy-to-understand manner remains a tricky and time-consuming exercise. Setting realistic expectations is obviously a critical element of any portal implementation, and it is important to be pragmatic about what you can achieve with your portal in the first six months, versus the first 12 months, the next 12 months, and so on. In this regard, we counsel all of our clients to assign a resource to keep portal content updated on no less than a weekly basis. User experience drives return visits, which in turn drives user satisfaction and adoption of the portal as a key tool on their desktop. Dashboards and portals have the potential to provide insights that legal operations leaders need to effectively manage the department. Participants of the Consero conference clearly expressed interest in the topic while recognizing that improvement opportunities are plentiful. As we prepare for the third annual CLOC Institute next month, we are excited about additional opportunities to engage on this topic and showcase our award-winning analytics platform CounselCommand. For more information on our upcoming demo sessions, contact me at kclem@hbrconsulting.com.